Do you watch TV with a netbook perched on your lap? Do you check your Facebook, LinkedIn, Twitter and MySpace accounts on your smart phone? Do have over 700 'friends'? Do you multi-task like no other generation before? You are probably part of 'The Net Generation.' And according to Don Tapscott, you are transforming the world as we know it. 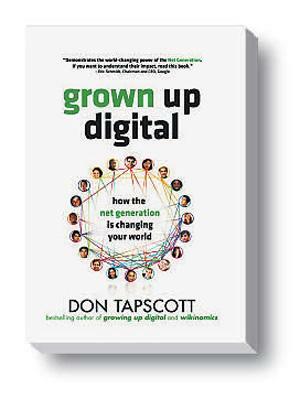 Grown Up Digital is the follow up book the Growing Up Digital (see what he's done there?) It's based on a privately funded $4 million research project "The Net Generation: a Strategic Investigation" where the author and his team interviewed 10,000 people to understand 'a generation's experience with digital technology'. Using this massive international research programme he subsequently combined qualitative feedback from Facebook and his own children to create a manual for understanding what 'digital natives' - or the 'Net Gen' - really think, feel and do. Don't be put off by the research methods section at the front; that's just proof that this is proper academically rigorous stuff. Tapscott brings the data to life, making it relevant, personal and engaging. He introduces you to the 'Net Gen'. He explains how they behave at work, in education, with family and friends. He describes how they challenge political and social norms, through their digitally enabled - and enlightened - networks. He describes a generation who are proactive and friendly activists, who give a damn about the world they live in (even though they are surgically attached to some form of technology). If you're interested in (or scared of) how society, politics and culture are changing, you have to read this book.